Hi guys before i even start like to add that i am not a tech(y) person so what i will write next is based on my own experience with my old laptop to compare to and i might or might not use not so techy words ;) . We had Acer Swift 7 SF714-51T for good while now with us - kindly supplied by ao.com , and in short as name suggest it is very swift - it starts instantly , and its one of the lightest and slimmest notebooks atm - which is brilliant as if you are a student or use one for work - it is an ideal companion and it wont weigh you down - it kind of feels like you are not carrying anything and its really surprising when you first take it out of the box as to how light it is -3.12 Kg to be precise . 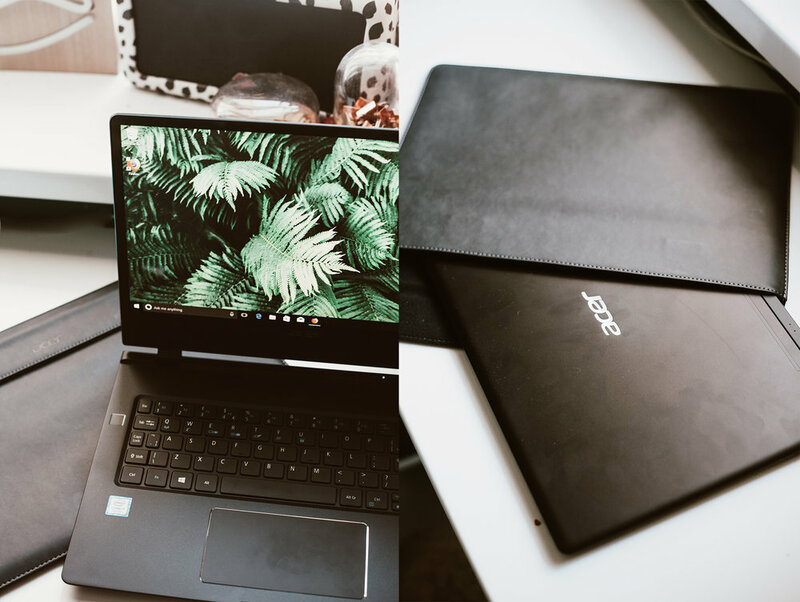 Acer have yet again delivered on a quality product the sleek black aluminum body , and touch screen display and a light up keyboard and a fingerprint scanner to keep your acer secure . 14 inch display is big enough and clear thanks to a full HD display , built in camera. I havent changed a laptop for years but what i have noticed that also ports have changed to a newer usb 3.1 ( type c ) which i think is why it allows this notebook to be this slim. It is worth pointing that - if your accessories that need to be plugged into the laptop have the older (standard) usb port - Acer have also got you covered - they have included a plug in adapter , something that usually you would have to pay for . There is also a case for your acer provided in the box so you can pack it when not in use or when you take it out with you . Touch screen takes a while getting used to as i seem to forget its there ;) but when i do remember to use it it id a joy to use when “ clicking” and accessing apps and programs . It is a pricey laptop , but i think the price reflects the built in quality as well as finish and extras - i also have a feeling that its build to last and it will serve our family well for years to come .